I first noticed these beautiful little bugs in my garden four weeks ago. Their fantastic coloring of orange, black and white was hard to miss. I didn’t run to my identification field book right away. I decided it was much more fun to watch these little insects instead. At first I thought they must be beetles because they were so colorful, but the triangular shaped shield on their backs gave them away. They were bugs, true bugs. In beetles the hard wing coverings form a straight line down the back. True bugs have a triangular shaped piece called a “scutellum”, instead. These flashy little bugs, only ¼” to ½” long, were only found on the spent broccoli plants I left standing in the vegetable bed. They seemed to be extracting liquid from the broccoli plants. The bugs had the sucking mouthparts, rostrum, that all true bugs have. The bug I was watching unfolded its rostrum from beneath its head and inserted into a broccoli seed pod. You can just see the feeding tube in the photograph above if you look closely. These bugs live multi-generational with eggs, new hatchlings, various size juveniles and adults, all sipping and living on the same plants. There is no larval stage in their life cycle like butterflies or beetles that have chrysalis or grubs. The newly hatched babies look similar to the adults, just smaller. This is called simple, gradual or incomplete metamorphosis. So, for weeks early in the morning I would go into my garden and watch the orange and black bugs make their way to their feeding places. They must retreat further down the plants into the cooler darkness of the vegetable bed at night. As the sun rises and the air warms, they travel up the stalks to the tops of the seed pods to warm themselves in the bright sun. 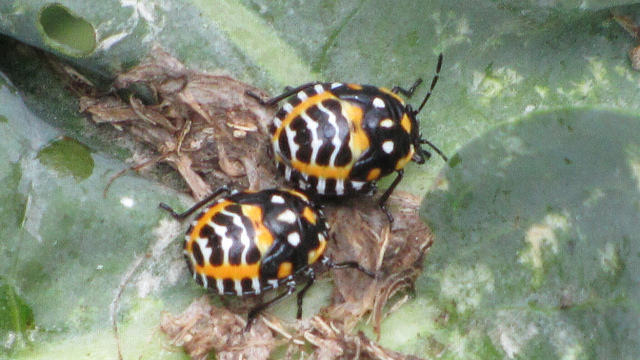 , it didn’t take me long to spot the Harlequin Bugs (Murganita histrionica) on page 129. They are also called Calico or Fire bugs. No wonder I hadn’t seen these bugs before, they are from the southern half of the United States. Apparently, if the winter is mild (which this past winter was), Harlequin Bugs can be found during spring and summer as far north as New England. Adults hibernate in plant debris and litter to survive the winter. Harlequin Bugs are common in gardens, fields, and roadsides. They feed on plants in the mustard and caper family. The bugs feeding causes white and yellow blotches on the plant. So, to find these colorful little bugs check broccoli, cauliflower, collards, horseradish, kohlrabi, mustard, radish, turnip, citrus and cherry. These are transported food crops brought to North America. It makes me wonder if these bugs are indigenous or newcomers to this land. It would be useful to know what, if any, indigenous plants these bugs eat. The female Harlequin Bug lays eggs on the food or host plant, just like female butterflies do. Another example of host plants being important. Observing these insects before running to consult the field guide made me really look at them. I appreciated their coloring and habits. I think if I had just looked them up in a book, I would have found the answer quickly and felt I knew everything about the bug, without really studying them. The first hand information I learned will stick with me long after the field guide words have been forgotten. Great post on the pretty bug but also on the pleasures of really SEEING with one’s own eyes. Your photographs of them are exquisite. Thank you for the information, Donna. You’re always welcome, Van. And hanks he photos did turn out very well. These are stunning little bugs. I really appreciate your comprehensive observations and especially like seeing those barrel eggs and hatchlings. Thanks, Scott. I was very pleased with the chance to photograph the eggs. Insect eggs are so fascinating. Loved your observations and the information on the bugs. Thanks Stephen. I think the species has help me realize how beautiful and interesting true bugs can be. I have a weakness for insects.